The SunFire 6800 was far from ideal. It took up too much space in my semi-finished (but soon to be finished) basement; however, the main problem was, being 32” deep, it was almost impossible to reach AV components from the back. Most AV components tend to be 10-14” deep, so that meant reaching in 18+ inches. My particular rack contains six Sonos ZonePlayers and two Apple TV’s, which required a 26”+ reach to get to the back of these components. Consequently, the sides were always off, which made it look awful (even in an unfinished basement) and made it difficult to cool properly. Something had to be done, and when I saw the tricked out Sanus racks (and the price tag) at CEDIA, I knew I’d found my answer.I chose the 36U CFR2136 rack, which supports up to 800lbs of equipment. I would have liked the 44U version, but it was just a bit too tall. The posts are pre-threaded and clearly marked at U intervals. Side and rear panels are branded with a raised Sanus logo instead of a cheap spray/stick-on logo. All shelves are vented and can be fitted with shelf stops (see below). Ganging kits are available that allow multiple racks to be ganged together. All in all, they’re aesthetically pleasing and very professional looking. The base and top come with solid and vented knockouts that can be used for fans or cable entry. The 3U repositionable opening on the back can be located at the top or bottom. Again, this could be used for fans or cable entry. 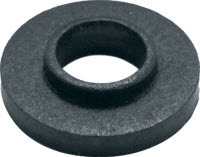 All screws contain non-metallic washers, so when used with shoulder washers (shown below) will isolate components from the rack, preventing ground loop problems. This innovative solution is a fully customizable accessory that serves as the single power source for all low-voltage equipment in a rack. With several 12v and 5v outlets, it eliminates many low voltage power supplies, and clutter, normally found in a rack. Thermostat input, as well as work light and fan control is also provided. By installing the Multi-volt Power Supply (CAPT01) in my rack, I was able to remove a portable work light (replacing it with four CALW01 LED strips tucked neatly inside the posts). I connect my existing three 12v fans to the thermostatically controlled outputs and placed the magnetic thermostat at the top of the cabinet (the hottest point in my cabinet). Best of all, I was able to replace five wall warts and external power supplies that powered the cable modem, router, two SiliconDust HomeRunHD’s and my IR repeater. I still have three 5v (USB) outlets and one 12v outlet available on the back of the CAPT01, as well as a 12v and 5v (USB) outlet on the front. I can now conveniently turn on the internal work lights with a simple flick of a switch on the front. This is, without a doubt, the single best product I’ve encountered for helping tidy up a rack’s low voltage wiring, while simultaneously providing work lighting and cooling. It’s probably the best $200 you could spend when installing a rack. CASS10. These are definitely one of my favorite accessories. They fit in the shelf vents and, with a simple 90-degree twist, lock in position preventing equipment sliding backwards when pushing buttons on the front. The only minor issue is that the shelf vents start 7-10” from the front of the shelf (depending on shelf height), so they can’t be used for really shallow components. They work great for my Blu-ray player and Sonos amps that require two front panel buttons to be pressed to pair with a controller. CAPC01. This provides eleven 2,400-joule protected outlets and EMI/RFI filters, which eliminate noise up to 30 dB (100 KHz – 1 MHz). A very useful feature on this unit is the adjustable, dual pull-out LED lights to illuminate rack equipment. As with most quality power conditioners, the unit comes with a protected-equipment guarantee ($50,000). 4 x 12v thermostat controlled. 2.5A max per jack. 10A total (all 12v jacks). CALW01. The Work Light connects to the MultiVolt Power Supply (CAPT01) and is controlled by the front panel switches. Up to three can be daisy chained together, which helps to reduce cabling. The base of the light contains two magnets, allowing it to located anywhere and easily repositioned. Additionally, supplied clips, which clip into cage-nut holes allow the light to be angled at 0 or 45-degrees. CASPK. Small components such as splitters, external power supplies, Apple TV’s, etc. 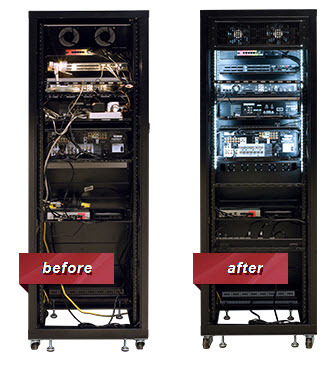 are an inevitable part of most rack installations. The small parts panel provides a solution for mounting these neatly in a single location. If you’re looking for a reasonably priced, professional and versatile rack system then Sanus could be the solution for you. The rack is constructed of high quality materials and ships with a practical complement of components for most installations and is priced comparably to a raw frame from other vendors. The rack I chose can be found online for around $1,000. For those with further needs, there’s an array of accessories from which to choose, and if more than one rack is required, ganging kits can be purchased. 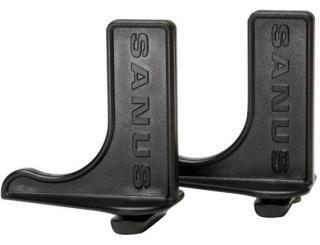 I have no reservations in recommending Sanus racks to the DIY user or custom installer. If you have an existing rack that's not ready for the replacement, I'd still strongly recommend giving the EcoSystem a look.